Bulls are going to give up easily; price is getting closer to target level of 61.8% again. If Eurodollar rebounds from this level once again, bears will return to the market and start new and fast descending movement. 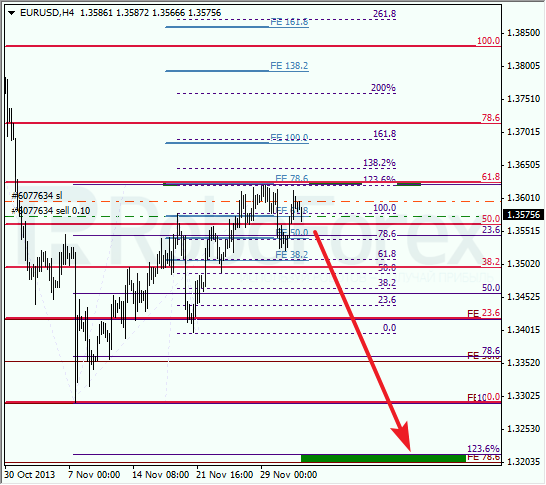 As we can see at H1 chart, pair couldn’t stay above local correctional level of 78.6% for a long time. Possibly, pair will continue moving towards minimum and break it during the day. Franc rebounded from level of 61.8% for the second time, which may result in new ascending movement. Right now, I’m buying very carefully, but if price continues growing up, I’ll increase my long position. Target is in upper area, where there are several fibo-levels. At H1 chart, price rebounded from level of 61.8% for the second time; it happened inside one of temporary fibo-zones again, which may result in reverse. During the day, pair may break local maximum. After that, I’ll move stop on my buy order into the black.